The world's largest working offshore wind farm - covering an area equal to 20,000 football pitches - has opened off the coast of Cumbria. The £1bn Walney facility already had 102 turbines before the completion of a further 87 earlier this year - dubbed the Walney Extension. Each turbine stands 623ft (190m) high, with the wind farm covering an area of 55 sq miles (145 sq km). It can generate 659 megawatts - enough power for 600,000 homes. Sitting in the Irish Sea 12 miles (19km) off Barrow-in-Furness, the wind farm overtakes the current largest operational facility, London Array, in the Thames Estuary. Danish owner Orsted began onshore construction of the project in 2015. Matthew Wright, UK managing director, said: "The north west region plays an important role in our UK offshore wind operations and our aim is to make a lasting and positive impact here." Energy Minister Claire Perry, said: "Record-breaking engineering landmarks like this help us consolidate our global leadership position, break records for generating renewable energy, and create thousands of high quality jobs." About 250 people will be employed in the operation and maintenance of the wind farm. The turbine blades were manufactured in Hull and the Isle of Wight. 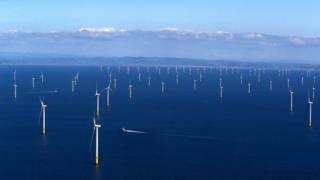 Orsted has pledged a Community Benefit Fund worth up to £600,000 for each of the wind farm's 25-year expected lifespan. It will support community and environmental projects in coastal areas of Cumbria and Lancashire.